For classical educators, developing the human person is the primary goal, and the cultural treasures of the past are the principal means to that goal. Making the thoughts, words, stories and beauty of Christian civilization a living part of students gives them standards and ideals that direct their maturation into adults who help shape their world. I am not coming to the Shire. You must settle its affairs yourselves; that is what you have been trained for. Do you not yet understand? Without realizing it, the four hobbits, three of them relatively young, have been prepared to become leaders of their society. At the beginning of the story, Sam, Merry and Pippin are much like their fellow hobbits of the Shire – decent folk but almost completely unaware of anything outside their little world. Most hobbits were not only unaware, but proudly so. Sam’s father was suspicious of the fact that Sam had learned to read: “Mr. Bilbo has learned him his letters—meaning no harm, mark you, and I hope no harm will come of it.” He had no idea why Sam left, and no interest in his tale once he returned. 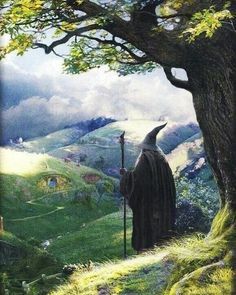 Tolkien, like Gandalf, admired many of the virtues that developed in Shire-life, but also deeply believed that as long as they remained in their uncultured state, they remained small-minded, small-souled and self-satisfied. Those hobbits attracted to Bilbo’s stories and poems of Elves and dragons, Frodo in particular, knew that the wider world held beauties (and dangers) vastly greater than anything that had ever occurred in the Shire. And they wanted to come to know that world. Gandalf, ever-seeking to understand more deeply the ways of Providence, sees the involvement of the hobbits as more than a matter of overcoming the Enemy. Frodo has been chosen to carry the dangerous and powerful Ring because the peculiar virtues of those content with a simple life make him less susceptible to its temptations. But more than this, these hobbits are being developed so that they can lead the Shire out of its cultural backwater and into a living relationship with the great civilization to be reborn in the new age of the world. The hobbits encounter this great civilization first through its foundational stories. They were attracted to Bilbo because of his stories (exactly what made Bilbo persona non grata to most of the hobbits). Strider, who guided them when Gandalf could not be found, eases their worries by telling the tale of Beren and Luthien, the greatest heroes of the First Age of the world, around the campfire. In Rivendell, the hidden abode of the Elves, they listen to their songs and read the Elf-lore. They learn of the ancient realm of Gondor and some of its history as they travel with Boromir and Faramir, sons of its Steward. Everywhere they encounter the heroic, the larger than life, an element completely lacking in the Shire. And through the stories, they come to understand their task, their journey, their own heroic act. We shouldn’t be here at all, if we’d known more about it before we started. But I suppose it’s often that way the brave things in the old tales and songs, Mr. Frodo….I expect they had lots of chances, like us, of turning back, only they didn’t. And if they had, we shouldn’t know because they’d have been forgotten. The hobbits aren’t formed simply by the stories, but by the great people who exemplify the ideals found in them. In Elrond, Aragorn, Galadriel, Theoden, the hobbits recognize what they lack; they come to admire these figures, and to be inspired by them. Each of the main figures they encounter accepts and honors the good as learned from the ancient stories; he struggles to live up to these ideals in the face of the demands made upon him by his particular task. Aragorn, the hidden heir to the throne of Gondor, is the pre-eminent example of this (which probably explains why his character is so completely altered in Peter Jackson’s movies). He shares Boromir’s pride in the nobility, beauty and wisdom of the Numenorean realms in exile; his dream is to reign as king of a reinvigorated Gondor and resurrected Arnor in a manner that would allow him to face his forefather, Elendil, without shame. His crisis is self-doubt not cultural angst — all the years of hoping, planning, preparing, suffering to fulfill his dream are falling into nothingness around him at Parth Galen, and he feels it to be his fault. When the quest needed a great leader to fill Gandalf’s shoes, he fails. Yet he conquers his self-doubt by following his clear duty to hunt for his captured friends across Rohan, becoming the man who, on his own initiative, challenges Sauron in the Palantir and leads his men through the horrors of the Path of the Dead. …You will read things out of the Red Book, and keep alive the memory of the age that is gone, so that people will remember the Great Danger and so love their beloved land all the more. JRR Tolkien was himself classically educated, and he understood the threat posed by a loss of Christian civilization. In the passing of the Elves at the end of The Lord of the Rings, he shares his nostalgic sorrow over the loss of the living memory of what was great and beautiful. But in the hobbits, through the education they received, he shares his hope of keeping what is best in it and having it flourish again.